When a mother of two decided to get a spray-tan before a friend's wedding, she didn't expect her young son to get one too. Gemma Colley decided to get the faux tan so she wouldn't look so pale against a yellow dress she'd purchased for a Indian wedding in the U.K.
"As I'm as pasty as Casper the friendly ghost I'd discussed having a spray tan done with my friend who's a beauty therapist," Colley told ABC News. "I'm not one to get regular tans, I think the last time I had one was also for a wedding about two years ago, but yellow isn't the most forgiving color on pale skin, so it was a no brainer." Colley breast-fed her 7-month-old son Cooper like normal after the session... And was shocked to see a 5 o'clock shadow after the fact. 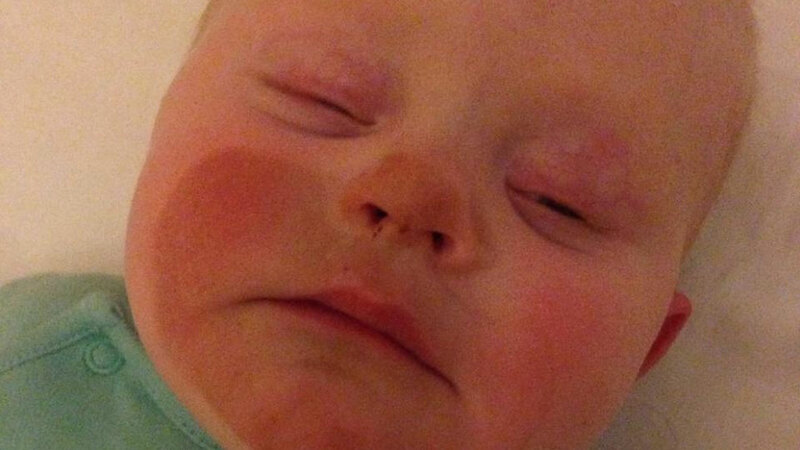 Cooper's darker complexion went away with a few baby wipes, but Colley decided to post a photo to Facebook first, where it quickly went viral. Colley says she shared the photo so other moms "could see the funny side to parenthood, and know they weren't the only ones to make mistakes." Some commenters were critical, but the response was overwhelmingly positive, with more than 100,000 "likes" in just one day. "All I can say is being a mummy is bloody hard at times," Colley said. "Anyone who claims they are the perfect parent, I'm not convinced this is possible. We all have mishaps, I was just brave enough to admit it, but at the end of the day we're all trying to do our very best to bring good people into the world."